The vertical barbecue requires very little maintenance. The cage grills can be cleaned in a dishwasher after removing the handles. Handles do not usually require cleaning. The ash tray should be emptied after each use. This is very important because the ash contains alkaline mineral residues which are very corrosive in the presence of water. Main frame of the barbecue. The main frame of the barbecue does not require special cleaning. It is never in direct contact with food or fat. It will thus not accumulate unpleasant odors. It is important to understand that the Verticook® BBQ is not intended for outdoor storage. Most parts are made of carbon steel painted with black lacquer designed to withstand high temperatures (600 ° C). Some parts of the barbecue are however exposed to higher temperatures, such as the firebox and the lighting chamber. The paint on such parts tends to flake off over time. This should be considered as inevitable and normal, and will not affect the performance of the barbecue. The steel sheets are sufficiently thick (1,0 – 1,5 – 2 mm depending on where they are located) to insure its durability. To ensure the longevity of the Verticook® barbecue, a few precautions are worth being observed. Store the Verticook® barbecue in a dry, ventilated place after use. 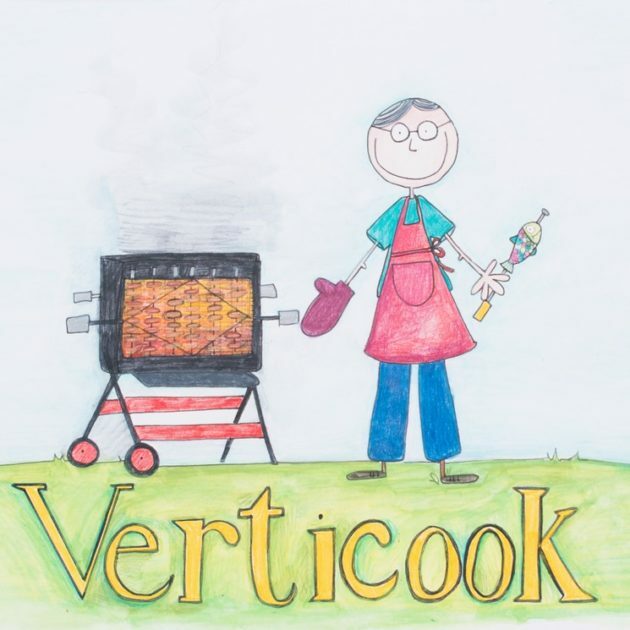 The Verticook® barbecue is designed to be easily moved around. Thanks to its easily foldable feet, it uses very little ground space. Paint touch-ups can possibly be made by using high temperature sprays that are available in any hardware shop. Make sure that cage grills and other accessories are stored under dry conditions. The firebox can be extinguished by simply letting the combustion take place completely. Charcoal will be consumed almost entirely. Poking the bottom grid with a metal rod will cause the residual ash to fall into the ashtray. Prepare a clean, flat surface to “demold” the foodstuff out of the cage grills. A marine multiplex plank placed on two trestles will do perfectly. Alternatively, the large tray offered in the “Accessories” tab is very convenient. Lay the cage grill flat to remove the pins and the lid grids. The pins will not be too hot as they reflect infra-red radiations. The cage grill can then be flipped over a large tray (see the “Accessories” tab) or a wooden cutting board. Gently hit the cage grill on the tray or board to detach the foodstuff from the cage grill. The “demoulding” using such method is very fast.